Six years ago Nikolai Petrovich Mozgovoy left the life... His soulful singing and unique voice have admired more than one generation of Ukrainians. The sad event made to unite many colleagues and followers of the great artist. Unfortunately, now beloved song "Kray, miy Ridny Kray" and "Zacharovani slova", which texts are voiced by characteristic velvet tenor-baritone vocal, we can hear only in recordings. 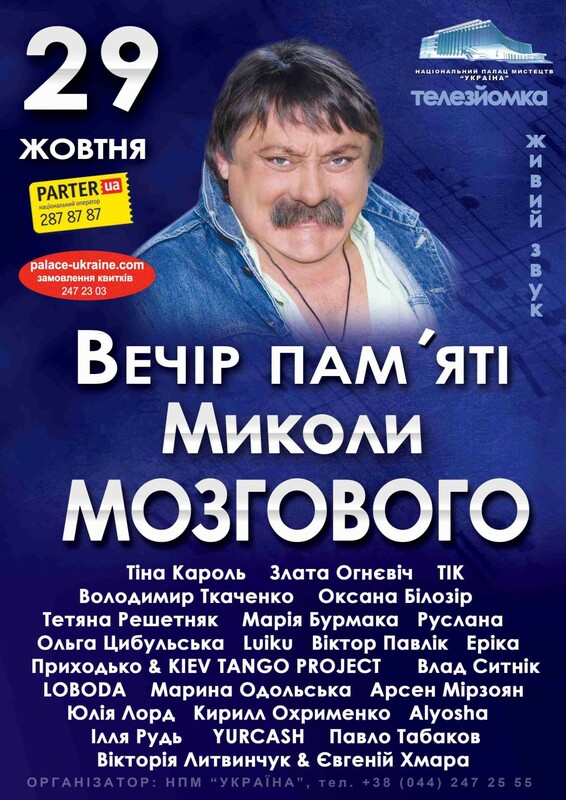 But on November 28, the fans of faded Ukrainian pop-stage star will be able to remember the old days at the concert “Evening of memory N. Mozgovoy”. It is symbolic that this riddled with bright nostalgia event will be held at the Palace of culture “Ukraine”, the largest concert hall of the country. Here Nikolai Mozgovoy worked as director from 2005 to 2010, until his death. Here is still working, as main director the widow of the artist, Violetta Mozgova, which will take part in the memorable event. And on stage this evening will be friends of the singer and young pop stars: Ruslana, Tina Karol, Oksana Bilozir, LOBODA, Maria Burmaka, Zlata Ognevich, "Tik", Alyosha, Vladimir Tkachenko, Tatiana Reshetnyak, Arsen Mirzoyan, Olga Tsybulska, Viktor Pavlik, Erica, KIEV TANGO PROJECT, Pavlo Tabakov, Vlad Sitnik, Marina Odolskaya, Julia Lord, YURCASH, Kirill Okhrimenko, Ilya Rud, Victoria Litvinchuk and Eugene Hmara.